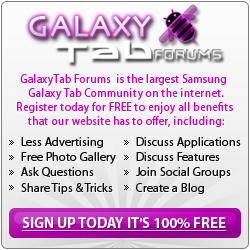 Seems like a great community for all the Galaxy Tab lovers. After a lot of reading and getting confused between the known and Chinese brands, I was rendered totally indecisive and clueless. Of course just like any other customer, I wanted the most feature-filled reasonably acceptable bang for my bucks. So I am asking for recommendations here before making move, to avoid buyer's remorse afterwards. I have now narrowed down to Galaxy Tab 7.7 GT-P6800 being the one (although more than a year old) to fulfill my current application usage behavior. 1. Moderate to heavy browsing /emailing/ usage of my ERP cloud app/ office productivity tools and app usage. 2. No heavy 3D gaming in particular, occasional usage of kids learning apps and games. 3. Occasional GSM (SIM) calling. Although have read a lot of positive reviews about it, i was trying to understand its standing and performance potential in the current day lineage of QuadCores and more tablet models pouring in from almost all major and budget brands. I guess the hardware specs are already mentioned all over the internet, and seem fine to me, however is its Dual-core/1GB RAM performance good enough in real world sense to be a sensibly future proof tablet for quite some time to come. Apart from the benchmarks, how is the practical feel of the tablet's performance when compared to any leading current quad-core machine with more RAM. Does it ranks up well (even if falling behind in some not so substantial areas). I hope anyone having this and any other current/latest model would be able to post a comparative reply and would help not only me but a lot of other potential buyers in the search of one. I have been using a dual-core 1G unit for almost 3 years with no issues. Like you I am not into gaming so it is quite adequate. Based on your needs, you should have no issues. Good luck.